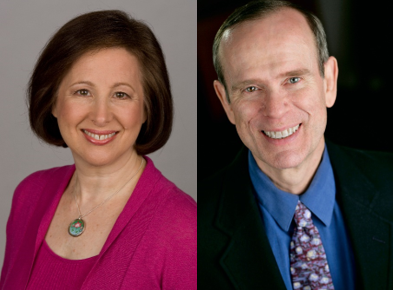 Dr. Richard P. Brown and Dr. Patricia Gerbarg, pioneers of Integrative Mental Health, offer their groundbreaking Breath-Body-Mind workshop. Discover a unique fusion of techniques drawn from qigong, yoga, Buddhist meditation, Orthodox Christian monks, martial arts, Open Focus Attention Training, and modern neuroscience, designed to activate communication pathways between the mind and the body, raise energy levels, regulate mood, enhance performance, reduce inflammation, dissolve pain, and enhance the sense of connection to oneself and others. Dr. Brown and Dr. Gerbarg share a unique blend of mind-body practices—breathing, tapping, movement, and sound healing. Slide and videoclip presentations highlight their scientific research and humanitarian projects serving survivors of the 2004 Southeast Asian Tsunami, military combat veterans, 9/11 World Trade Center attacks, Gulf Horizon oil spill, war and slavery in South Sudan, genocide in Uganda and Rwanda, Middle East refugees, and Rohingya child refugees in Bangladesh. Dr. Brown guides participants through rounds of movement with VRBPs, including Coherent Breathing and Breath Moving. The gentle movements can be done standing or sitting and are suitable for adults and children. Awareness and mindfulness of breath and changes in mental and physical states are cultivated. Attendees enhance learning by participation in group processes. Clinical issues, indications, contraindications, risks, benefits, and guidelines for augmenting psychotherapy with VRBPs will be included. Cases illustrate restoration of connectedness/bonding through VRBPs that shift the individual from defensive states of fear to states of safety and bonding. Patricia L. Gerbarg, MD, assistant clinical professor in psychiatry, New York Medical College, graduate Harvard Medical School and Boston Psychoanalytic Institute, practices Integrative Psychiatry and serves on the APA CAIM task force and the American Botanical Council board. She researches mind-body practices for stress, anxiety, PTSD, and mass disasters. She and Dr. Richard P. Brown teach Breath-Body-Mind and co-authored Non-Drug Treatments for ADHD, The Healing Power of the Breath, and with Dr. Phillip Muskin How to Use Herbs, Nutrients, and Yoga in Mental Health, and Complementary and Integrative Treatments in Psychiatric Practice (American Psychiatric Association Publishing, 2017). www.Breath-Body-Mind.com. Richard P. Brown, MD, associate clinical professor in psychiatry at Columbia University, graduate of Columbia University Medical College and Cornell University Psychiatry Residency and Psychobiology/Psychopharmacology fellowship, lectures internationally and co-authored over 100 scientific articles, chapters and award-winning books. His neurophysiological theory, exploring effects of yoga breathing in treating anxiety, depression, PTSD and stress-related medical conditions, has been validated in clinical trials. A certified teacher of Aikido (4th Dan), yoga, Qigong, and meditation, he provides Breath-Body-Mind programs for healthcare professionals, yoga teachers, mass disaster survivors, first responders, veterans, school teachers, and patients with psychiatric and medical conditions. www.Breath-Body-Mind.com. Early Bird rate of £300 until 15 November.